PICK UP THE NOVEMBER/DECEMBER ISSUE OF IMAGE INTERIORS & LIVING TO SEE THE WINNERS. Following a nationwide search by our five judges, along with a helping hand from the readers of Image Interiors & Living, we have narrowed down the shortlist of nominees for this year's Design Awards. 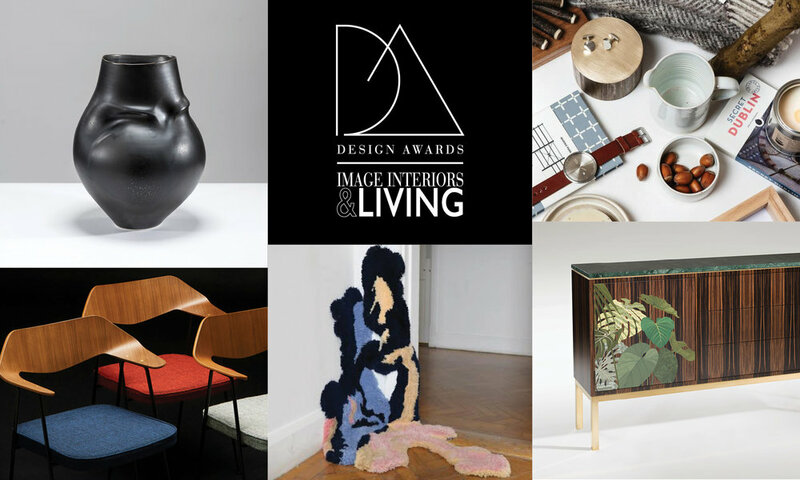 After much deliberation, debate and discussion, the below nominees represent those who have gone above and beyond to create and innovate in Irish design over the last twelve months. We are incredibly proud to honour each and every one of them. Founded by Francie Duff and Sonia Reynolds in 2016, Stable focuses on Ireland's rich textile heritage while creating beautiful, contemporary pieces, including a new range of Irish linen blankets, towels and kimono-style robes. A family-run business that's always innovating and collaborating. Based in the Mourne Mountains, Mourne Textiles have developed an extensive range of fabrics, since re-establishing the business with original looms in 2012. Inspired by the rugged Donegal coastline where the mill is located, the McNutt of Donegal team weave a wide variety of wool and linens in both contemporary colours and heritage designs. Creating exquisite Irish tweed for a broad customer base, this father-son team have inherited their weaving skills through five generations of Molloy & Sons. Clockwise from top left: Arran Street East, Diem Pottery, KaroArt, Adam Frew Ceramics. Handmade pottery created in their Little Green Street studio, Arran Street East merges architecturally influenced aesthetic and traditional processes to produce new useful objects for everyday life. Instantly recognisable by a signature colour stripe at the bottom of their contemporary white ceramics, Diem Pottery are known for their simple pieces of tableware and popular pottery classes. From his beautiful vases and one-off pieces to tableware items including jugs, teapots and mugs, Adam Frew's elegant brush strokes, tactile shapes and sea hues continue to evolve and impress. Working out of her Dublin studio, Karolina Grudniewska of KaroArt creates unique pieces that tell whimsical stories full of humour and colour. Each piece is handmade and painted in her refined sketch style. Renowned for silver tableware that includes vessels and candelabras, Cara Murphy has recently branched into enamelling, introducing colour and pattern into her unique designs. Based in Belfast, Sara Flynn works with thrown clay that is then manipulated during the drying process to form her unusual, sweeping, abstract vessels. Drawing plaudits for his huge wooden sculpture in the atrium of the National Gallery, Joseph Walsh's magnificent pieces in marble, glass and wood make him one of Ireland's most innovative creators. Creating contemporary ceramics that are both sculptural and functional, Derek Wilson's grouped vessels were widely exhibited and drew lots of attention throughout 2017. A butcher by trade, Fingal Ferguson has long had an interest in knives after inheriting his uncle's knife collection a child. Creating unique designs to suit the purpose and the user, each covetable piece is designed with functionality at its core. Hand-dying linens using organic dyes made from plants, local food waste and foraged materials from the Irish landscape, Kathryn Davey creates beautiful, hand-dyed linens with minimal environmental impact. Creating a luxury range on top of their successful Field Day candles, the subtle aromas of the Rain candle by Field Apothecary captures the very essence of the Irish landscape, at once evocative and familiar. Originally working as a joiner, Toby Hatchett of Hachett Sound kits out many Irish festivals, businesses and private homes with custom-built timber and metal sound systems. The Flair Oro Shower Enclosure by Design Partners creates a seamless shower motion, with a magnetic motion that quietly improves everyday living. Producing one-off, exquisite and intricately detailed museum-quality furniture, each Zelouf + Bell piece is functional and made with the highest standards of materials, construction and design. Combining the natural beauty of wood, stone and brass, Ed Coveney designs and makes each piece of the Elements of Action collection. Each item focuses on the simplicity and strength of its form. Alison Ospina designs and creates graceful, freeform chairs inspired by Shaker design principles of simplicity, quality and functionality, using locally coppiced hazel. Design-led furniture for children's interiors, Bunny & Clyde produce their innovative and environmentally-friendly hardwood pieces in Co. Waterford. Clockwise from top left: J Hill Standard x Daniel Rybakken Secant Collection, Mourne Textiles x Robin Day 675 Chair for Conran Shop, Ceadogán Rugs x NCAD and Norin O'Brien, Cooper Handmade Furniture x Wild Cocoon. Presented at the Salone del Mobile in Milan, the hand cut crystal discs are suspended and supported by a metal skeleton light is diffused through the disc. Secant functions as both a light and an installation piece. A re-collaboration in essence, Mourne Textiles teamed up with Conran Shop to create a 2017 special edition of the iconic Robin Day 675 chair in three heritage colours, made on the same loops the original fabric came from. Displayed in the National Gallery earlier this year, this handtufted Ceadogán rug was designed by NCAD student Noirin O'Brien following a semester working with the rugmakers. Named 'Berlin' and inspired by the city's architecture, this one-off piece was then auctioned off for the Peter McVerry Trust. Combining their unique skills, Cooper Handmade Furniture and Wild Cocoon teamed up to create a simple oak bench, typical of Ciaran's design, with Deirdre's ombré effect handwoven lambswool fabric. An interior designer for over 25 years, Gillian Sherrard has a particular interest in period properties and is known for her neutral palette with pops of modern touches, creating timeless, harmonious spaces. Known for her impressive vision and ability to create modern spaces that are both cohesive and comfortable, Suzie McAdam has brought her luxurious aesthetic to diverse residential and commercial properties this year. As a practice GKMP work across public buildings and spaces, but their approach for domestic restoration and conservation is much admired. From beautiful use of wood to protection of original decoration, their spaces are warm and inviting. With a portfolio that is both strong and accessible, Laura Farrell’s imaginative flair and eclectisim can be seen the striking renovation of Patrick Guilbaud at the Merrion Hotel, and in multiple home projects that combine clean lines and contemporary furniture. Clockwise from top left: Alan Meredith, Moses Rowen, Domino Whisker, Lisa Gallagher. Since graduating with a Masters in Architecture in 2015, Alan Meredith's wooden furniture and sculptures have been exhibited both nationally and internationally. 2017 saw him creating new smoked oak vessels and winning the DCCoI Future Maker award. Specialising in innovative design with an industrial, functional edge, it makes sense that Moses Rowen holds degrees in both industrial design and mechanical engineering. With a focus on metal works and modern concepts, he works on a range of pieces from vehicles to furniture. Upon her return to Ireland from California, Domino Whisker was one of the stars of Brown Thomas CREATE exhibition. Producing delicate pieces of embroidery on linen, her designs are exquisitely intricate and staggering beautiful for fashion, homeware and display pieces. Having just graduated from GMIT with a degree in textile design, Lisa Gallagher featured as one of our 'Grads to Watch' in the magazine, with her unique collection of handmade rugs. Inspired by the rugged coastline of the west of Ireland, pastel pinks and peaches bleed into inky blues that echo the swirling seas. Clockwise from top left: I am of Ireland, Irish Design Shop, Cait & I, The Old Mill Stores. Working with some of the finest artisans in the country, I am of Ireland is an online store and gallery space displaying pieces of Irish craft and artwork that capture the unique qualities of their makers and the landscape that surrounds them. A must-stop Dublin shop for any design fanatic, Irish Design Shop has a curated collection of pieces by makers from across the country, from Adam Frew to John Hanly. This autumn they are working with their suppliers to create a series of workshop focusing on making and mending. With a funky range of ceramics, textiles, home-wares, art prints and stationary, Cait & I was set up in 2016 by sisters Kathleen and Tara McGowan in the heart of Sligo town. They place an emphasis on Irish design and Sligo artisans in particular. With a wonderfully considered collection of homewares and gifts, The Old Mill Stores began its life as a specialists in antique stoves, but now their small store in West Cork is a hive of interesting design objects, ideas and pieces selected by the husband-and-wife team. With a background in marketing and beauty, Barbara Taylor set up Living & Beauty blog as a way to explore her interest in interiors and design, resulting in a hugely popular Instagram account brimming with simple DIY ideas and buys, as well as beautiful spaces. An award-winning Irish architecture & interior design company run by Denise O'Connor, Optimise Design uses Instagram to showcase their refined and architecturally-led design concepts, projects and inspirations. A calm soothing digital space. Working as a freelance stylist and musician, Ciara's Instagram feed is a combination of her work, inspiration, dreamy rooms and beautiful photography of her life. Ever come across a beautiful shop, whether it be homewares, textiles, design or fashion, on your travels? It's probably been featured on The Shopkeepers, founded by Irish woman Paula Flynn. With a keen eye for beautiful spaces, the team at The Shopkeepers has curated a collection of stunning shops from all over the world. The winners of each category will be announced in the Nov/Dec issue of Image Interiors & Living on shelves from October 20, 2017. Their commitment to progressive ideas and projects in architectural and social advocacy make them the perfect partner.